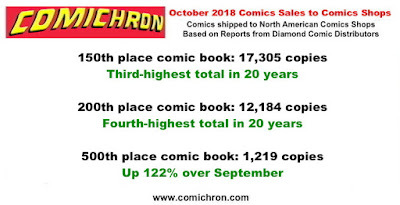 As reported last week, comics and graphic novel orders through Diamond Comics Distributors ended October ahead for the year-to-date, thanks to one additional New Comic Book Day during the month. 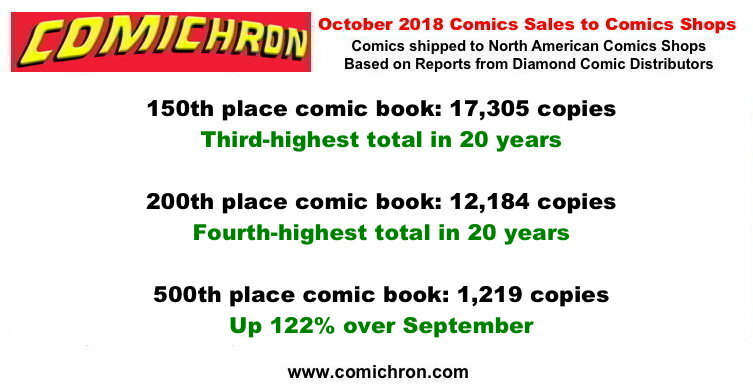 We also know the month benefited from particularly strong sales of middle-tier titles, thanks to Comichron estimates, just posted: click to see the comics sales estimates for October 2018. October was generally without the major launches that previous months saw; the major event for the month (besides the Venom movie) was Walking Dead Day on Oct. 13, which saw 15 different "blind bag" editions of previous issues (along with new variant covers) on offer. Batman #56, with its foil edition, finished first in units and dollars among comic books, with Walking Dead #1's 15th anniversary edition in second. The issues landed around 107,500 and 106,100 copies shipped respectively in North America. But as noted, the performance of titles in the midsection of the charts was strong. The 150th place title shipped 17,305 copies, the third largest amount at that level in 20 years. The 200th place title sold 12,184 copies, the fourth highest amount in two decades. The 50th, 100th, 400th, and 500th place titles all hit one-year highs. While in part due to more releases on offer after a year in which publishers had cut their slates back, it appears that, in the absence of a blockbuster title for the month, retailers may have spread their ordering dollars around to other issues. 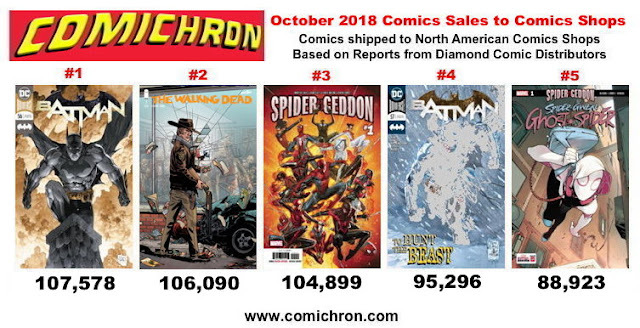 October's total comics shipment of 8 million copies was the largest since May 2017, which had the 25¢ Saga #43 padding the totals. The Batman: White Knight trade paperback topped 12,000 copies shipped in October. It's now also nearly certain that Infinity Gauntlet will be the top-ordered graphic novel from Diamond in 2018; this would be the first time Marvel led that list since Civil War in 2007, after a five-year run with Saga volumes in the lead. Click to see sales for comics and graphic novels for the year to date; you can also see the top titles by year.